The prolific writer M. J. 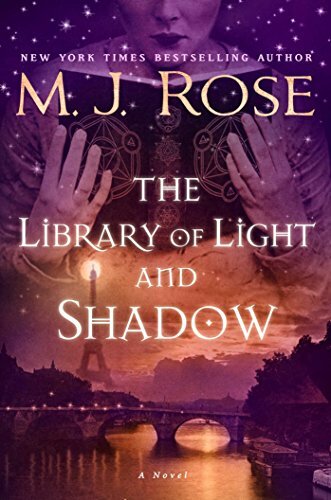 Rose mesmerizes in The Library of Light and Shadow, her third, and hopefully not last, in the Daughters of La Lune series. History and fantasy, love and magic, and the powerful influence art exerts on life and fate are all intertwined with masterful assurance so that readers are immediately drawn into the turbulent ambience of the 1920 in New York and Paris. It is post World War I and the artist, Delphine Duplessi, is in high demand for her “shadow portraits,” which she paints while blindfolded. The problem is that the portraits reveal the most intimate secrets of her subjects, causing more than one tragedy that sends Delphine fleeing from her home in the South of France to New York. A daughter of La Lune, Delphine is cursed with having only one chance at love. And that love she finds in Mathieu. But after committing the mistake of painting his portrait and witnessing a future she intends to avoid, she once again flees. This time she heads from New York back home, where she decides to wash her hands of the problematic shadow portraits. But her twin brother, Sebastian, her manager and the man to whom she presumably owes her life, will not allow that. He convinces her to accept a profitable commission from the eccentric opera singer Emma Calvé, to search for an ancient text of alchemy that is hidden somewhere in her mysterious château. The Library of Light and Shadow, a wonderfully apt title, is a book of secrets. Many, in fact nearly all the characters, including Delphine herself, harbor a dark secret; she will have to unravel this secret, layer after layer, in order to move on with her life. Dora Levy Mossanen is an internationally acclaimed bestselling novelist and book reviewer for The Jewish Journal. Her most recent novel is Scent of Butterflies.